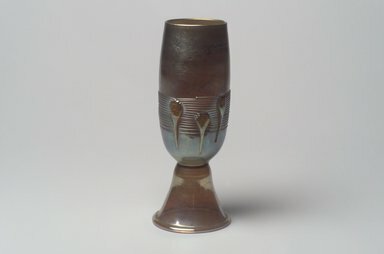 Opalescent or "Favrile" glass footed cup. Elongated ovoid cup with thread decoration on body over which are applied six prunts. Foot in form of segmented cone with fold at base. Of amber bottle glass fused with metallic oxides giving hues of purple, gold, blue, etc. iridescence. CONDITION: Excellent.